don’t know if you’ll be able to make it that far. You have been trained in CPR, but the guy that taught the course did not tell you how to perform it on yourself..!! 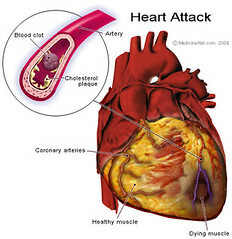 Since many people are alone when they suffer a heart attack, without help, the person whose heart is beating improperly and who begins to feel faint, has only about 10 seconds left before losing consciousness. However, these victims can help themselves by coughing repeatedly and very vigorously.A deep breath should be taken before each cough, and the cough must be deep and prolonged, as when producing sputum from deep inside the chest. The squeezing pressure on the heart also helps it regain normal rhythm. In this way, heart attack victims can get to a hospital.